White witch… Magie Noire by Lancome The Perfumed Dandy’s Halloween Scent | The Perfumed Dandy. Oh, I love Magie Noire! It has replaced Tresor as my favourite by Lancome! I must pick up a bottle someday. Yes, I think I rather prefer Magie Noire to Tresor too, though I do have a soft spot for that rose jam of a scent! This couldn’t be more different though: dark brooding and, especially in the vintage, very bewitching! Another perfume I have meaningful first acquaintance with! I wore this in my late teens, back in them olde days when a young lady’s idea of perfume was something magical, dark and sophisticated! I loved this when I was about 18 – the idea of ‘noir’ was so appealing – femme fatales and the like. Yes, one wishes those ‘old days’ would return when a first perfume was regarded as must a challenge, a step into the ‘unknown, adult world’ as taking a sip of wine, tasting asparagus, reading ‘grown up books’. Rather than another trip to the childish sweet shop. Magie Noire does resonate (especially in the vintage) very much of a certain era, though I prefer the term ‘redolent of’ to ‘dated’, which is so often used pejoratively. I couldn’t agree more, I sense a real change in the market at the moment, the resurgence in leathers, the occasional ‘nouvelle chypre’ the general depth and complexity of many niche perfumes. Perhaps, rather then witnessing the death of the olfactory arts as many proclaim we are on the cusp of a new great age…. perhaps The Dandy is an eternal optimist! As for Magie Noire though, your reminiscences are perfect and no perfume has ever lived up so fully to its name. I suspect you are not alone in keeping at an arm’s length from Magie Noire, especially these days, and it’s true one would certainly stand out in a crown when wearing the original! I love that we both went for Anjelica Huston as well. The coven is in sync. 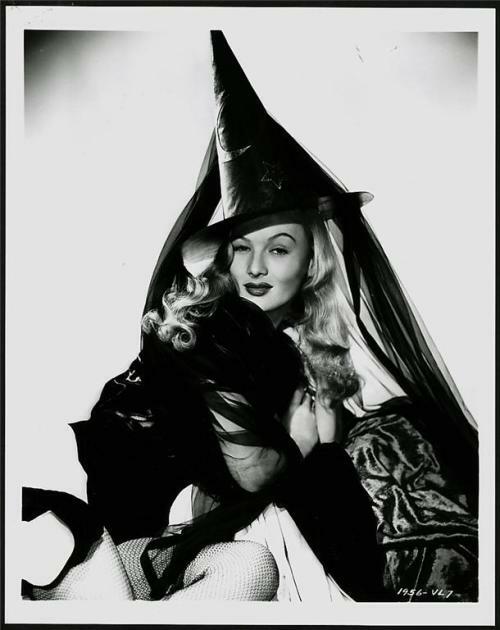 Surely Angelic is the most perfect (and prolific) screen witch we have ever had… and wouldn’t a real witch go under just such a pseudonym!?! Hah, so we chose the same scent for Halloween! I LOVE Magie Noire, and hope you had a Happy Halloween, Mr. Dandy! By my counting that makes at least four of us who all independently chose the same scent for our Halloween… coincidence, or something more sinister? I’m not sure if I’ve ever tried Magie Noire – not sure why… I have Magie (it’s not bad but I do not love it) – one of the perfume re-issued by Lancome for their anniversary La Collection but I do not know in what relationship these two are. Now, as far as I can recall Magie was a warm amber with a slightly powdery musk… the polar opposite of the dark, moss and patchouli and spices and animalics Noire. I wonder though if they are related in a ‘white witch’ ‘black witch’ way, at least in the imaginations of the people at Lancome? I liked it back in the day when my mother wore it, but they have changed the formula since the 80s, haven’t they? You are 100% correct, Magie Noire has almost been changed beyond recognition, it is tamer, flatter and much less adventurous now, thoughit still retains more bite than much else on the market. Thankfully such was the popularity of the fragrance in its heyday that there seem to be an awful lot of vintage bottles on the market still… though for how much longer one can never tell. I wonder… has the Perfumed Dandy worn J’ai Osé? Just another siren of that time. I have not, but it is now added to the (600+) long list and hopefully one day its turn will come! Sandalwood, oakmoss, amber and vetiver? Golly, what a combination! You are truly to be commended for services to black magic!! I don;t think I can imagine ever getting through quite so much of a single perfume, even one as spell binding as Magie Noire. You are so right to hold onto that vintage EdT, the old stuff is undoubtedly the very best so far as this brand of magic is concerned. I smelled this years ago in the late 80s and cannot remember it. My nose was unsophisticated back then so I would love to smell it now. Dear old trusty Lancome! I think you must have been severely congested when you tried this back in that dark decade! For very few people cannot remember Magie Noire! I fear there might be a little to much of the ‘skank’ hovering around this in the vintage for your tastes, but do give the newer version a try when you’re next hovering around a Lancome concession, your sophisticated adult nose may well find something it likes! The first ever grown up perfume I had bought for me was Estee Lauder’s beautiful when I was 18. This may well have been an indicator of my taste in 1988!